drawback: cockroaches. Almost all Florida homeowners will deal with these pests at one point or another. At Critter Control of West Palm Beach, our pest control experts have the tools and know-how to completely rid your home of cockroaches. If you are dealing with a cockroach problem, consider the following tips to help prevent an infestation. Cockroaches can last a long time without food—up to an entire month. But they won’t last long without water. One way to help prevent cockroaches in your home is by denying them a water source. Check all the pipes in your home and fix all the water leaks. Another way to stave off cockroaches is by keeping your house clean, therefore denying them of food sources. Start with the kitchen. Be sure to wash all the dishes (don’t leave dirty dishes overnight) and clean food up right away after meals. Sweep the floor to clear away crumbs, and clean up spills as they occur. Keep food containers sealed, never leave fruit sitting out on the countertop, and don’t forget to clean your range top—cockroaches are attracted to grease. Cockroaches can be hard to find since they love convenient hiding places. Be sure to keep your yard clear from any debris to avoid attracting them near your home—as the weather cools, cockroaches will find their way inside where it’s warm if measures aren’t taken. Move wood stacks away from the house, and clear up piles of leaves, clippings, and yard waste. Also, be sure to check the exterior of your home for any cracks or holes. Seal any openings to keep unwanted pests out. Take the time to check the interior of your home as well. Seal cracks inside kitchen cabinets, in window moldings, and around pipes in the kitchen and bathroom. This will help to eliminate hiding and breeding areas. 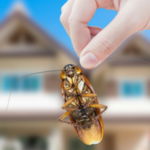 If you have a cockroach infestation, call Critter Control of West Palm Beach. We’ll use proven methods to effectively rid your home of roaches once and for all.